Among my thirty tracks at the Free Music Archive as of this post, 66/55 is the most downloaded. The track was written in a backseat down Interstate 55 from Chicago to Peoria, Illinois, on a 1995 trip to say goodbye to my wife’s grandmother. The song looks back and around at 20th century America. Shirley and Normal are towns along the way, and “Normal: Next Exit” is just a perfect highway sign. you know that story. it’s old. ’cause history never changed it. The music was co-written in 2001 with Bill Kollar, a brilliant New York-area engineer and producer, who coaxed out the glorious rhythm guitar verse progression and overall tempo. I hear noises outside my door. They’re the kinds of noises you can’t always ignore. Drunken lovers stumblin’ to their floor. held up by one another’s lurch. and they’re crawlin’ up those side stairs again. to find them trippin’ up that 12th step again. Misjudgin’ the water, scrapin’ itself on a shell. and listen to the drunks as they knock into my walls. I light one up and splinter the match in three. And with that window closed, the smoke is all I breathe. this one’s for lovers forced to live apart b/c of distance and/or time. not sad, tho. it’s in that moment when one knows the other’s coming home. But I think I know why they stare and feel this way. just as those hollow people rise from bed. they won’t see me starin’, ’cause i’m always wearin’ shades. They want what I got. They fear what I got. They would die for what I got. I must have love – that’s why they all stare at me! Surrounded by loneliness for blocks ahead. ‘Cos my baby’s at home & she sings to me every day! a rock/pop song sneaks out from behind an ambient intro. what you never know never hurts. if we never meet again, rest assured. what you never know never hurts. back in two thousand three. a life beyond the rave. we could curtain the world away. but nothing works that way. wrote this in 1996 on a chicago to peoria drive. The theme of this week’s disquiet junto project was creative reuse — call it recycling, or unconsumption, or upcycling, or compos(t)ing. Four objects from garbage pails at work or home were developed into an original musical track that would be used as background music for a PSA about recycling. We were allowed to transform the sounds of these elements, but only lightly, so as to respect their inherent sonic properties. In my track, all objects are represented in their native state, either alone or interacting with each other, as loops or one-shots with minimal processing. The soundscape underneath the raw sounds is a layering of each live recording in a processed state. I tried to keep processing to a minimum. Each processed sound was only either time stretched or resonant filtered, with 0 or 1 more effects applied on top (harmonics, pitch shift, or wah-wah). In this way, I think the processed sounds retain their sonic signatures, though some of them got blissfully strange (e.g., the eerie trash-wailing ~2:00 is a time-stretched, pitch-shifted bendy straw being pulled open). The 20th disquiet.com junto project in May 2012 explored the inherent creative limits of a mobile app. All participants employed the same app to complete the project. Everyone working on this project used two instruments. One of those instruments was NodeBeat, an app available for iOS (iPhone, Touch, iPad), for Android, for Blackberry, and as a cross-platform (Flash) implementation. The other was an instrument of our choice; this second instrument was to fall into the broadly defined category of “traditional” — i.e., a keyboard, a guitar, woodwind, percussion, etc. Step 1: Create a piece of music in NodeBeat. Step 2: Record a segment of that music no shorter than 30 seconds and no longer than four minutes. Step 3: Use that segment as the basis for a track employing one additional instrument. I wrestled with the app’s ability to free-form soundscapes, so in the end, I chose to keep the the nodes and beat generators stationary. The app makes some classic electronica sounds and the keyboard’s square wave brought me back into a new wave head. Once programmed, I “played” the app for about 2:40, with no particular structure, just turning things on and off while playing the keyboard (in major pentatonic) that runs across the screen behind the nodes. Took me a few takes to find something I liked, and this is still a bit messy, but it was truly fun and i think i got a pretty big sound, in a way, for doing something totally on the fly. Didn’t record in the app, though, but rather into Sony Acid from an iPad plugged direct into a MOTU interface. Then I played Jolie, my Gibson ES-335 Dot Reissue, over the NodeBeat track in an open D# tuning through a 1961 Fender Tweed Champ emulator with the drive set at 8 and a bit of presence. Three guitar takes in all. Each was live, no punch in and everything got minimal processing (compression, enhancement, EQ). A “demo” in all senses, but also a window. And as always, the junto took me down a road I would never find on my own. This track employs the app NodeBeat, created by Seth Sandler, Justin Windle, and Laurence Muller. as embraces lead to encounters. to make make sure i’m safe. if i did not need saving. This project explored the concept of graphic notation. We were challenged to treat the provided photograph as if it were a musical score. the beautiful photograph inspired poetry. i imagined a transient man, a regular in the alleyway, who often calls it home. i wrote the words first, then put sound to them. words are below. the ratio of the full size image on my macbook was ~23 x ~18, so the track is right around 2 min 30 sec. used the vertical length as a frequency range. the pipes were white, so i took them literally to represent white noise. the frequency of the white noise sample follows the pipes’ descent in the left part of the photo. the proportions of the photograph gave me a loose vertical range of 0-1800hz. the white noise runs through a high-pass resonant filter and drops from 1800 until it hits the sky. there are 2 bursts of full noise as the horizontal pipes are crossed at ~70sec. the noise again blows out full in the middle sky section and then recedes to reflect the scattered white artifacts on the right half of the picture disappearing into shadow. the bass was timed with the windows as you move across the photo. i wanted a metallic sound to represent the fire escapes so i plucked my guitar behind the bridge through the opto-trem and screamer and got a sound i liked. as always, junto opens up an absolutely fascinating creative journey. This track treats a photo by Yojiro Imasaka as its score. More on Imasaka at yojiroimasaka.com. The 11th disquiet.com Junto project in March 2012 required me to make an original field recording, and to then make something of it. It focused on rhythm. I captured audio of an N train (from inside the train) going over the Manhattan Bridge as well as sounds from the Canal Street and Atlantic/Pacific Street stations in Manhattan and Brooklyn, respectively. The assignment allowed that “to [your recording] you can add whatever sounds you like, but the rhythm should be central and prominent in the finished track.” I added some drums and cymbals for drama, but did not bury the train in the kit. Certain newer model R142 subway cars have propulsion mechanisms that emit tones as they accelerate and excite the steel rails with electrical current. Many people swear the trains sound out the first three notes of “Somewhere” from West Side Story. I caught the tones coming off a J Train leaving Canal Street and so couldn’t resist manipulating them to finish the 1st phrase of the song (“there’s a place for us…”). At that point, the phrase demanded to open the piece. The first three notes are as the train sings them. From those, I created the last two notes of the “Somewhere” phrase and a couple more notes to resolve to the root note. I have a terrible habit of ending phrases on roots; couldn’t break it here. NYTimes story about the “Somewhere” subway sound. My raw capture of the acceleration tones for this project. Dowsabel (chris wells, Columbus, US) loves obsolete words, and he took his musical name from the Latin for sweet and beautiful. His music lives up to the promise in his name, and his remix of my remix of a collision of bird sounds and acoustic guitars provides exponential entertainment and purpose to my track (which is below his track notes). This is a remix of the beautiful “flying time” posted by Westy Reflector for Disquiet0009-avian. I took it in some slightly different directions with reverb, distortion, reversals and playrate changes, and accentuated the subtle two-partedness that I heard in the original. It is recognizably the same piece (I think). 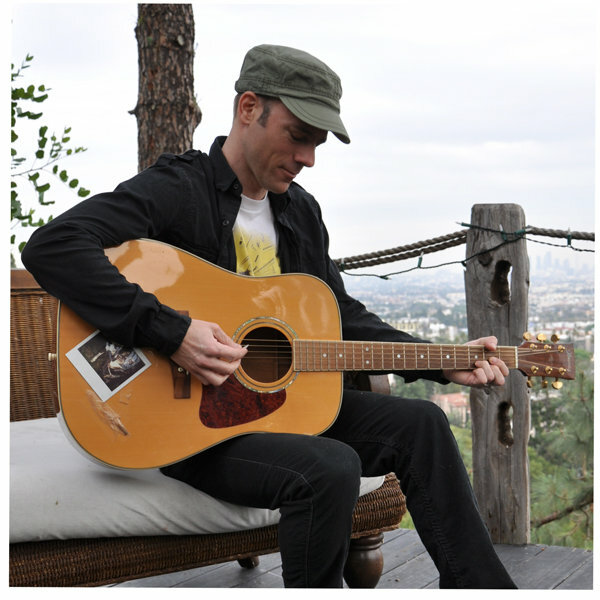 a thrush and an acoustic guitar. like a supercalafragalistic cartoon on your shoulder. my wife often leaves for months to work on film projects, and her absence always gets me wistful. this track’s more about this feeling than anyone in particular. but that wave crashed on a midnight drive. and opens up a door. and traded them for days. and all those shades of gray. but she just couldn’t sleep over the marquee light.